Book: Stroud Subscription Rooms by Marion Hearfield and published by SLHS in 2015 is available at meetings, or by post – please click here for details. Archive: There is a link to the online digital research archive of the early days of the Subscription Rooms via Marion’s website. Clicking this link will open a separate tab on your browser. Close the tab when you have finished and your link to this SLHS page will still be open. 1990-09-08 SDC plans to install a lift, estimated cost £40,000, though some thought the money could be better spent for the benefit of disabled people. 1991-01-16 STC member says plan to turn George Room into an art gallery is an attempt to turn Stroud into a jet-setting town. 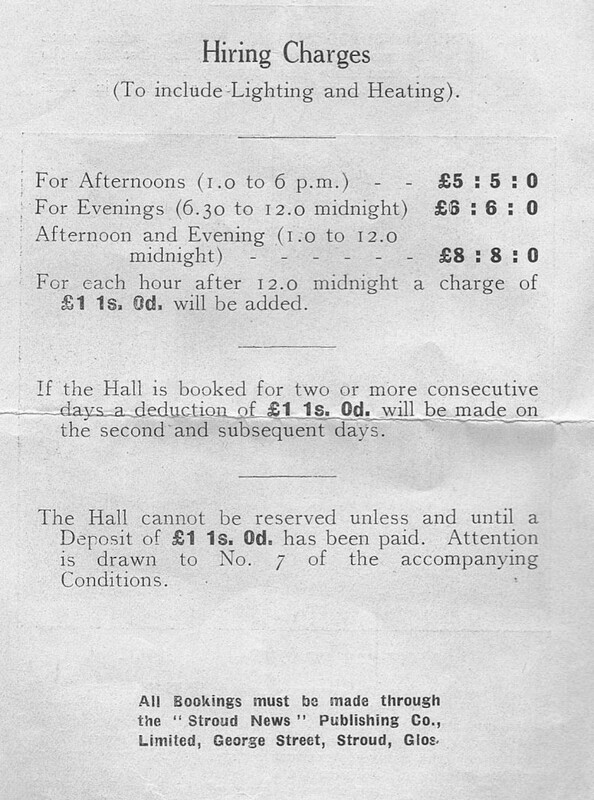 1991-05-01 Angry townsfolk want to know why it cost £20,000 to fit 11 new chandeliers in ballroom. They were specially designed to fit the original style of the building. 1991-05-01 The lift should be installed during this present financial year. 1994-11-01 Peace garden planned for forecourt in time for next year’s VE/VJ celebrations. Before the last war, the area was fully enclosed by railings. During the war it housed an air raid shelter. 1994-11-10 Stroud Light Music Choir complained that their soloist had to cancel his appearance because he could not get up the stairs. 1995-02-17 Fire chiefs ordered a massive reduction in seating capacity, reducing the main hall from 500 to 350, following new guidelines in fire regulations. Stroud Brass Band Festival says it has put on its last event – they will have to go elsewhere (to the Leisure Centre). 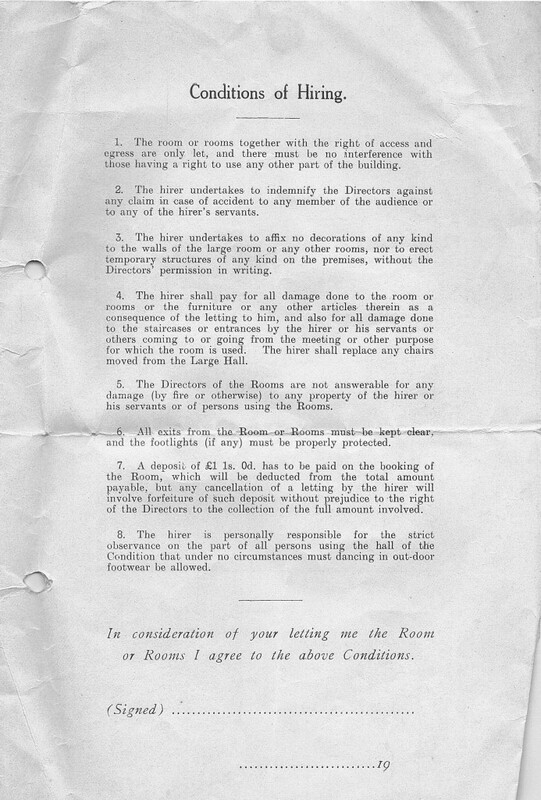 1995-06-05 Rescue proposal of £400,000 proposed to save this top venue from ruin. 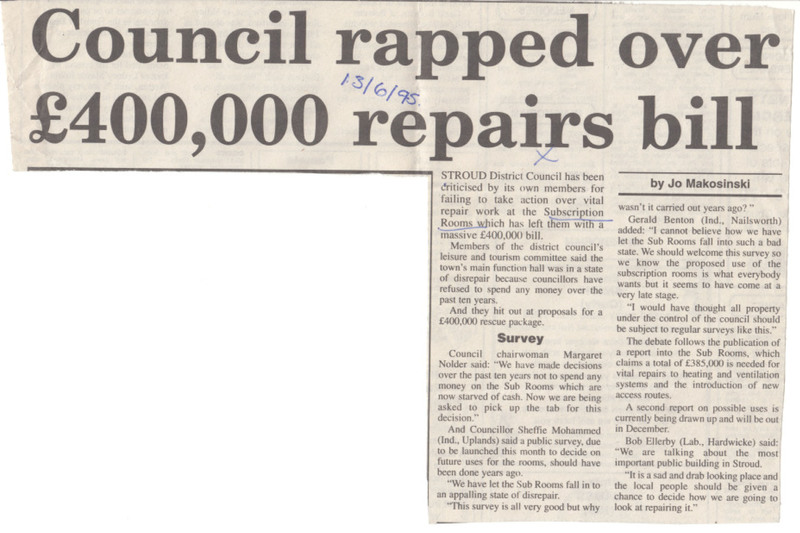 1995-06-13 Council rapped over £400,000 repairs bill. 1995-10-05 Losses of almost £2,000 a week revealed. Lettings raised only £36,000 last year, requiring a subsidy of £1,800 a week. 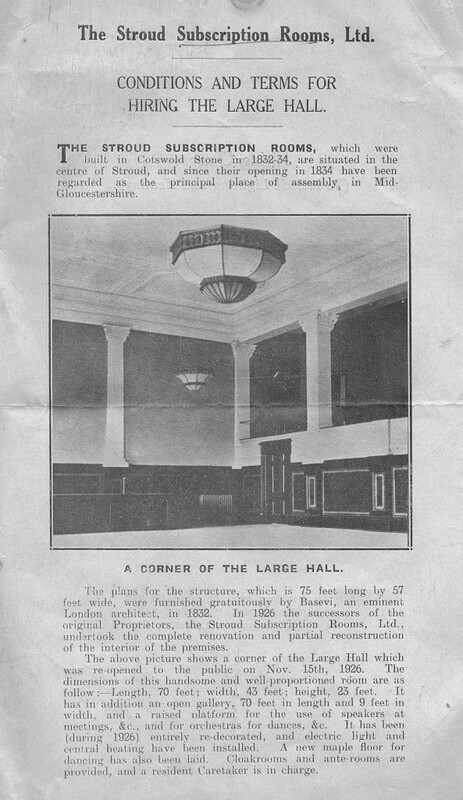 Comparison shows that Cirencester’s Cornhall, Gloucester Guildhall and Cheltenham Town Hall cost similar amounts. The level of spend on maintenance is close to the minimum that can be expected for such a public building, used by members of the public for up to 13 hours a day, 6-7 days a week, throughout the year. 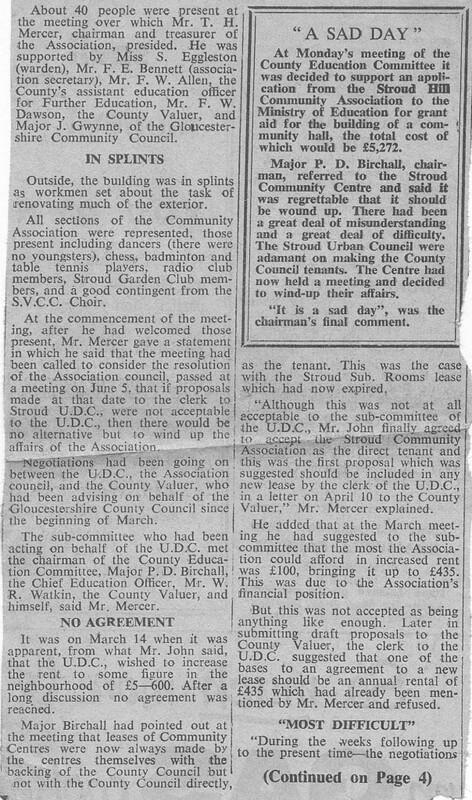 1995-10-16 New study to decide the future of the building, valued at £490,000 in the latest council accounts. 1996-04-03 Brainstorming session with SDC members, chamber of trade, and Subs Rooms users to discuss its future, following revelations that the building cost £2,000 a week in subsidies from the SDC. 1996-09-19 Pupils from St Rose’s Special School were unable to attend their prizewinning for the Stroud in Bloom competition. Three of the lighter children were carried up the stairs. 1996-11-12 SDC wants to change the forecourt – either return to grass, or re-design. 1996-12-02 Emergency action required when inspection revealed the floor of the Subs Rooms is unsafe. All dance events have been banned. 1997-02-13 New proposal shown to councillors for new arts quarter costing £2m (if Lottery bid wins) or £243,000 if it fails. £243,000 is pledged by SDC and £200,000 by STC towards regenerating the town centre. 1997-03-26 Ambitions £1.8m bid for National Lottery grant. 1997-06-17 Plan unveiled for £1.6m redevelopment of Subs Rooms. Lack of investment has resulted in capacity being slashed and props holding up the main floor. The scheme will provide disabled access with a lift, a new rear entrance and reception hall, increased hall capacity to 500, and new heating, ventilation and changing rooms. And upgrading of the forecourt. Uses not conforming to the new Arts theme (such as the Tourist Office) will be moved. 1997-11-14 The Sub Rooms name will not be changed to the Laurie Lee Centre if the Lottery bid succeeds. The title will be ‘the Laurie Lee Centre at the Subscription Rooms’. 1998-02-09 More than 1,000 people have failed to persuade SDC to abandon the new Arts Centre plans for the building. The Pop-In charity runs a senior citizens’ canteen that will have to move if the plan goes ahead. 1998-04-14 Stroud Cancer Research Campaign chairman concerned that the annual bazaar will not be able to go ahead because of planned closure. 1998-04-21 Landscaping options put to public. 1998-05-18 Petition to save the hornbeam tree opposed by Civic Society. 1998-05-21 The building will stay open until the end of March, so bookings can continue. But Pop-in Centre helper Margaret Herbert said they had only been given until August. 1998-06-08 Campaigners have collected more than 2,200 signatures from people wanting to protect the hornbeam tree. 1998-06-17 Successful campaign to save the only town-centre tree – the hornbeam on the forecourt. 1998-11-24 SDC has staved off closure of the Sub Rooms until after the next Fringe Festival. 1998-12-19 Ambitious plans collapse after failure of Lottery bid. 1999-03-30 More than £600,000 will now be spent on upgrading the building. The original proposal budget was £300,000 but sale of council land at Far Hill will increase it to £600,000. An earlier National Lottery bid for funds has failed. 1999-09-27 Sub Rooms will close on 31 Sept for the long-awaited £500,000+ revamp. 1999-12-02 Fears that revamp will turn the forecourt into a building site. 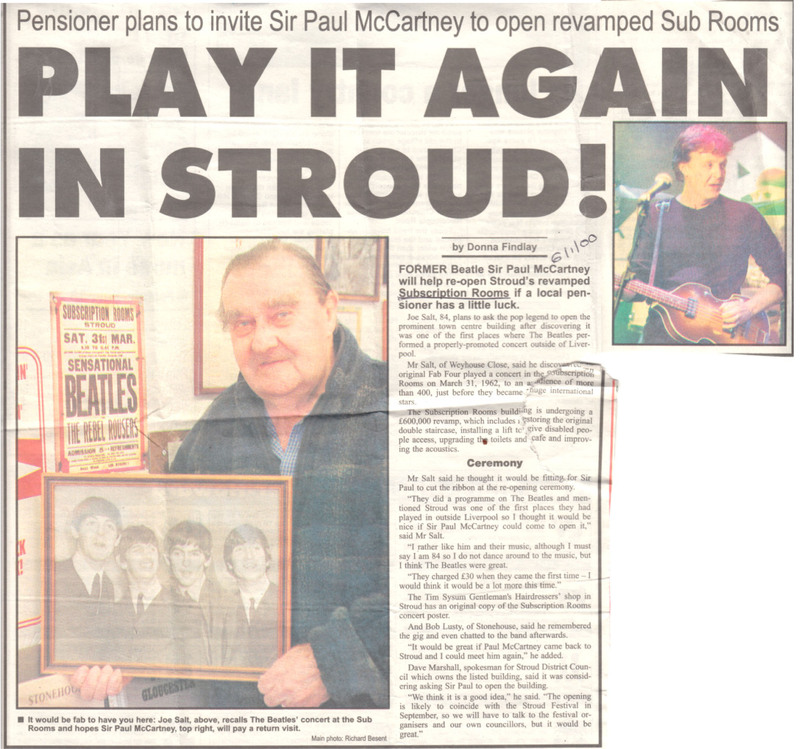 2000-01-06 Stroud pensioner suggests Sir Paul McCartney be invited to re-open the building. The Beatles played a concert here on 31 March 1962, to an audience of 400. Their fee was £30. Tim Sysum Gentleman’s Hairdresser’s shop in Stroud has an original copy of the Sub Rooms concert poster. 2000-02-01 Work starts next week on long-awaited revamp. The building has been closed for four months. 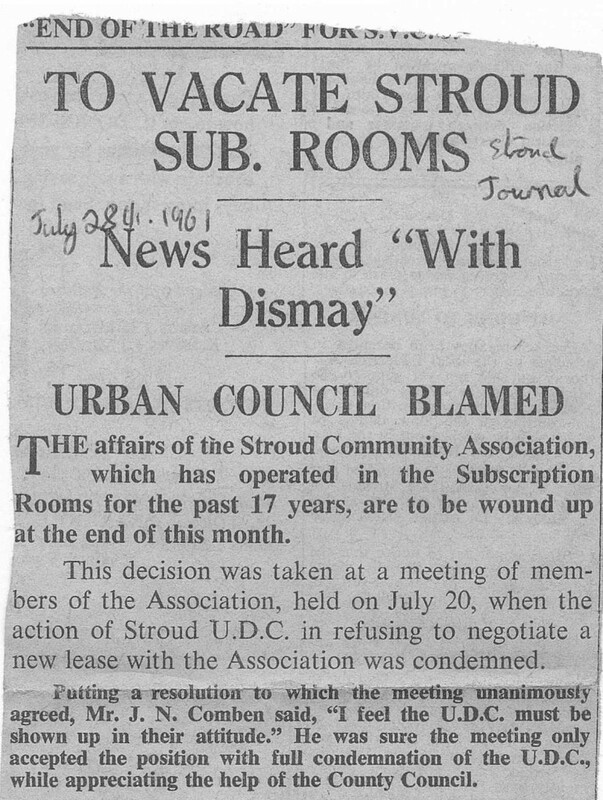 2000-06-01 Stroud Brass Band Festival organisers angry that the building will not be ready for autumn bookings. We have been let down. Charities and other Festival organisers are also disappointed. 2000-09-08 The final bill is set to rise by £50,000 – the amount hoped for in exchange for a long refreshment franchise, which has just failed. 2001 ? The heat from the new £30,000 computer-controlled lighting gantry is intolerable. 2001-02-26 Barely has the £750,000 revamp finished than builders are to start work again after a piece of stone fell from the outside and injured a passer-by. 2001-04-19 Work starts next week on the £220,000 transformation of the town’s central square. £50,000 has been donated by English Heritage. Work will include paving George Street with setts.